Meeting Faith - Description | W. W. Norton & Company Ltd. 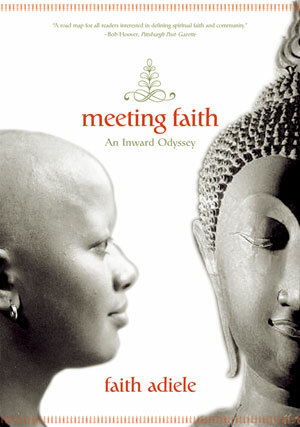 Reluctantly leaving behind Pop Tarts and pop culture to battle flying rats, hissing cobras, forest fires, and decomposing corpses, Faith Adiele shows readers in this personal narrative, with accompanying journal entries, that the path to faith is full of conflicts for even the most devout. Residing in a forest temple, she endured nineteen-hour daily meditations, living on a single daily meal, and days without speaking. Internally Adiele battled against loneliness, fear, hunger, sexual desire, resistance to the Buddhist worldview, and her own rebellious Western ego. Adiele demystifies Eastern philosophy and demonstrates the value of developing any practice—Buddhist or not. This "unlikely, bedraggled nun" moves grudgingly into faith, learning to meditate for seventy-two hours at a stretch. Her witty, defiant twist on the standard coming-of-age tale suggests that we each hold the key to overcoming anger, fear, and addiction; accepting family; redefining success; and re-creating community and quality of life in today's world.